For thousands of years, women and men have taken part in wearing earrings. Native Americans have perfected the art and, depending on which tribe you look at, their earrings differ drastically. For example, the Navajo will incorporate a variety of stones in the same larger settings that accompanies most of their jewelry, while the Hopi will stick to their traditional use of overlay silver to create truly stunning pieces. Each tribe has their own techniques and it’s important to know these differences before you look into buying a certain piece. The Navajo have a very distinct style when it comes to making Navajo earrings. As with most of their jewelry crafting techniques, the stone is prominently featured, whether it’s a turquoise piece or made of coral. You will notice that Navajo earrings, in contrast to the styles of other tribes, are quite ornate in general. Navajo artists really like to utilize their materials and use a lot of whichever stone they have chosen with an equivalent amount of sterling silver. The traditional Navajo piece will be rather large and quite stunning, whether it’s a necklace; earrings, or bracelets, Navajo pieces are easily picked out from the crowd. As for the stone of choice, there are a few common choices that Navajo artists typically stick to when they design their earrings. Traditionally, they will use turquoise, coral, or oyster shell and less often they will use Lapis Lazuli. Another common practice is using multiple different stones to create a multicolored piece. From there, it’s really up to the artist what direction they take their pieces. Many Navajo artists will stick to a simple geometric shape, while others might choose to use a symbol for their earrings, like feather, bear, or even a bird. Navajo artists can also use patterns on their earrings as well. 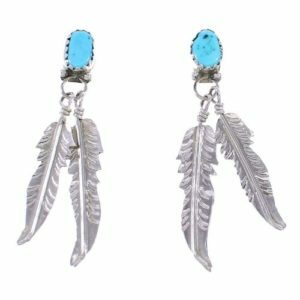 The main aspects that people should look for, in Navajo earrings, are the proportions of the pieces and the stones being used.